Rick Gregg Sculpture "The Guardian"
Thai mythological guardian lion sculpture 19th or 20th century. The well carved winged figure sitting upright with aged black and red paint, traces of gilding. Small part of base missing otherwise in wonderful antique condition. The lion, representing royalty, strength, and courage, was the personal symbol of kings, who were believed to be gods as well. As a guardian of sacred precincts, the lion defended against evil through both divine and royal protection. 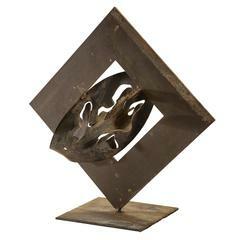 Beautiful aged patina to wood, paint and gilding give the sculpture a mellow color. Overall, a wonderful piece in very good antique condition, ready to add to your collection. A Thai Verdigris bronze Buddha head Late Ayutthaya style in verdigris patinated bronze, the bust on a later stand. Ketumala missing. 17th century or later. 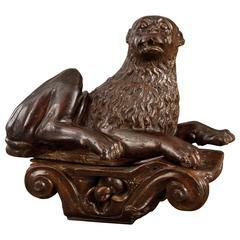 A charming and well carved lion at rest with head turned, on an ionic capital. Very good antique condition, a beautiful example, ready to add to your collection. Abstraction titled heart. Signed: D. Maltier. Antique Thai carved wood mythological Garuda sculpture raised on a square plinth. Thai wood hand-carved sculpture of Buddha. Double faced terracotta sculpture of mythological figures.